My apologies for the long hiatus- school and life in general took over my time the past few months, and I was at NYU the past two weeks for summer courses. However, I'm happy to say that I'm back with plenty of time for blogging (oh wait, college apps... but I have lots of time for now!). Also I'm so happy to be typing this sentence right now. And this one. AND this one. 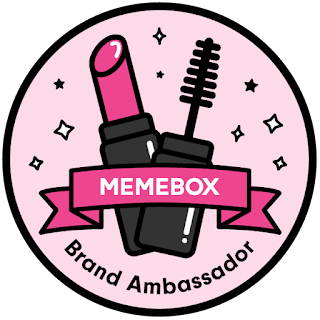 Even though I took a break from blogging, I definitely didn't take a break from testing out new products, and have A LOT of things to review for you all. 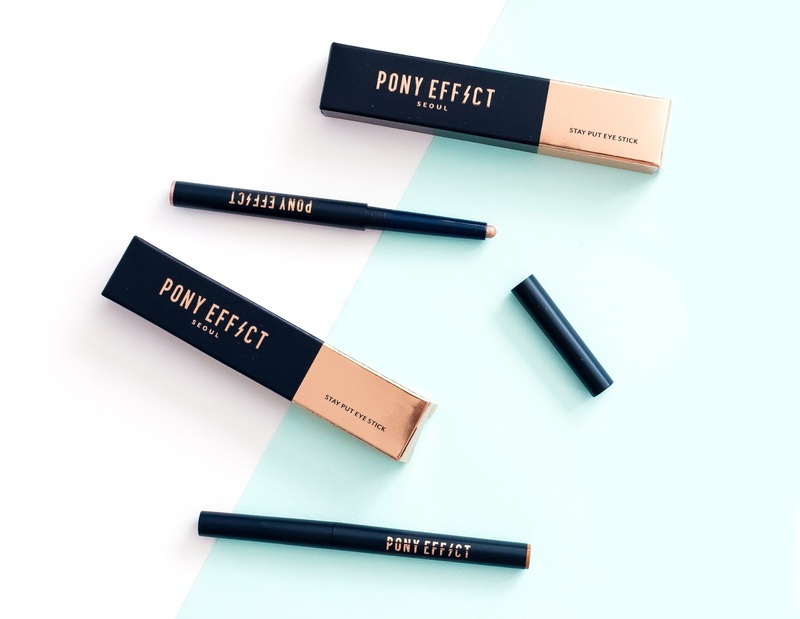 Starting off with these eyeshadow sticks from PONY EFFECT. 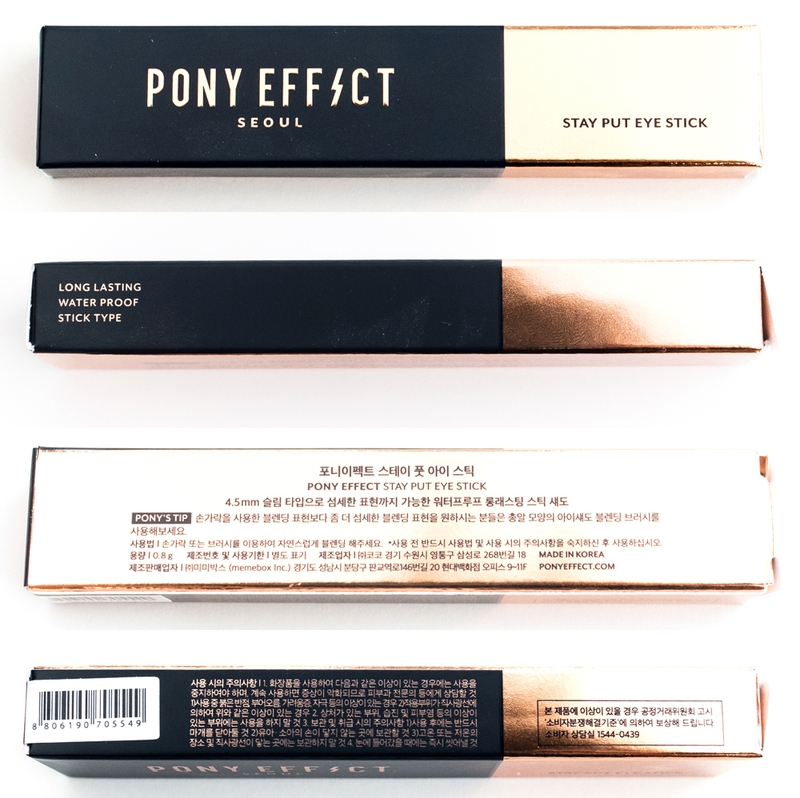 For those of you who don't know, PONY EFFECT is a brand created by Korean makeup artist Pony, who also has her own YouTube channel. I love her and her tutorials, but I was never really interested in her own brand because I had my doubts about the quality. However, after trying her Essentials line that was released in March, I have been obsessed. Take this as a spoiler that the upcoming reviews on products from her brand will mostly be raves. Mostly. Now that you've been warned, let's begin! 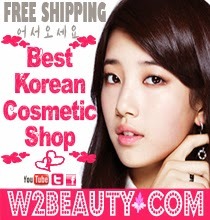 Description: Swipe, blend, and go - effortlessly master natural to smoky eye makeup looks with Stay Put Eye Stick! Designed with a sliding gel formula, it glides on the skin like a dream, blends easily, and sets to be completely smudge-free. Here is the box that the eyesticks come in. To be honest I feel like it's a waste of packaging because it's wide enough to fit two in one box. Even though it's not a big deal, it would've been more environmentally friendly if the manufacturers chose to use a slimmer box. The Stay Put Eyesticks themselves are much slimmer than most eyeshadow sticks. 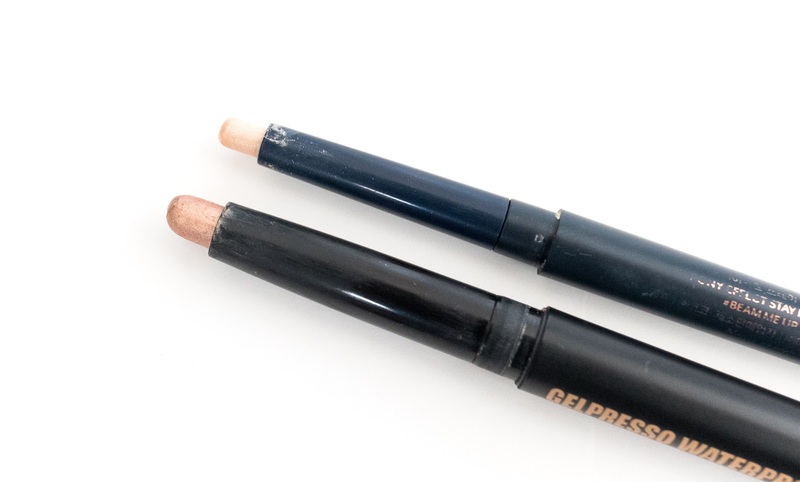 Here I'm comparing it to the Clio Gelpresso Waterproof Shadow, which is visibly thicker than the Stay Put Eyesticks. I find that there are both pros and cons to having a slimmer stick. The slimness does allow for a more precise application. However, that also means there's less product. Also, it may just be me, but I find that these are more fragile as well, something that I unfortunately discovered when I pressed down a little too hard while swatching the product. Nevertheless, I do like how it's easier to line the undereyes with this since it's slimmer. I just wish there was more product in there to make up for the fact that it's not as thick as most eyeshadow sticks. A definite pro when it comes to these stick shadows is that they're also pretty long lasting, with only a little bit of fading after 8 hours of wear. All of them are quite pigmented as well, as shown in the swatches below. #Used To is a shimmery brown that leans slightly bronze. I used this mainly on the outer corners of my eyes, or on some occasions I apply it onto an eyeliner brush and use it as an eyeliner instead. This method actually works surprisingly well, even better than a number of gel liners possibly due to its long lasting formula. #Cup of Joe is a matte light brown that really does resemble the color of coffee mixed with cream. I love using this by itself on days where I'm going for a simple, natural look. I also like using this as a base since it's such a light, neutral color. #Vixen is a gorgeous shimmery burgundy that would be perfect during the fall. I haven't found much use for this because I normally don't wear dark/bold colors, especially during the summer, but it is a very pretty color. #Overthinking is one of my favorites because it's perfect for highlighting the undereyes, and also works well on the lid, whether it's for a touch of brightness at the center of the eyes, or as an all-over color. This shimmery gold isn't too yellow either, so it would look good on all skin tones. #Beam Me Up is a really pretty ivory glitter, but I'm kind of conflicted on this shade because the formula could definitely be better. It just doesn't seem as creamy and smooth as the other shades, and the glitter could be a bit finer. The pigmentation seems to be lacking a little as well. However I was able to use it as an undereye highlighter by applying it with a small, dense eyeshadow brush, so I'm not too miffed by it. What's amazing about these eyeshadow sticks is that they have never creased on me. Ever. My lids do get oily throughout the day sometimes, which usually causes creasing, but it never happened with these. I don't use eyeshadow primer, by the way, so that's pretty impressive. They have incredible staying power as well. In fact, when you apply them you have to be fast about blending them in because they set pretty quickly, and once they set they do not budge. That does make layering a little bit difficult, since sometimes I don't act fast enough at blending out the edges and then it just doesn't look good. Trust me, be quick and make sure to always blend these out (actually, that's a rule for everything when it comes to makeup). Personally, I've always preferred using eyeshadow sticks as a base shadow to help keep any other shadows I layer on in place throughout the day. Or, I like to use them as a finishing touch to add a bit of sparkle to the center and corner of my eyes, and also to highlight underneath my eyes (you know, the aeygo-sal). 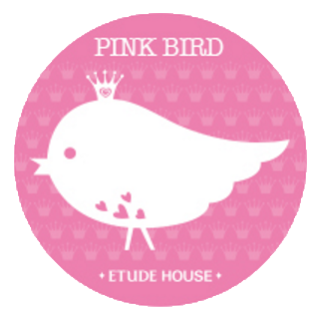 In fact, eyeshadow sticks are great for that because of how precise and creamy they are, with pretty much zero fallout. I almost never use powder eyeshadows to highlight my undereyes now ever since I started using stick shadows. Anyways I would recommend these eyeshadow sticks to anyone, even if you have oily lids, thanks to its amazing staying power and pigmentation. 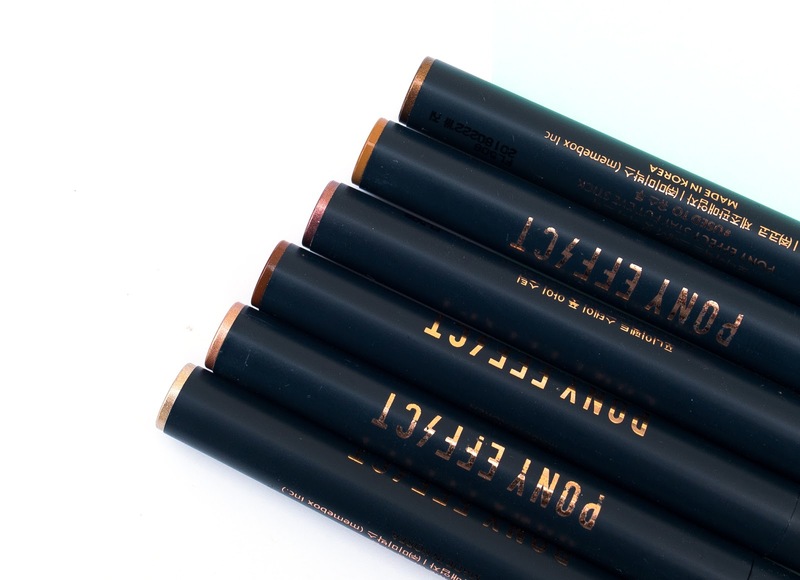 They are unfortunately a bit on the pricey side, and I do think there are other eyeshadow sticks with just as good of a formula and with a cheaper price point. 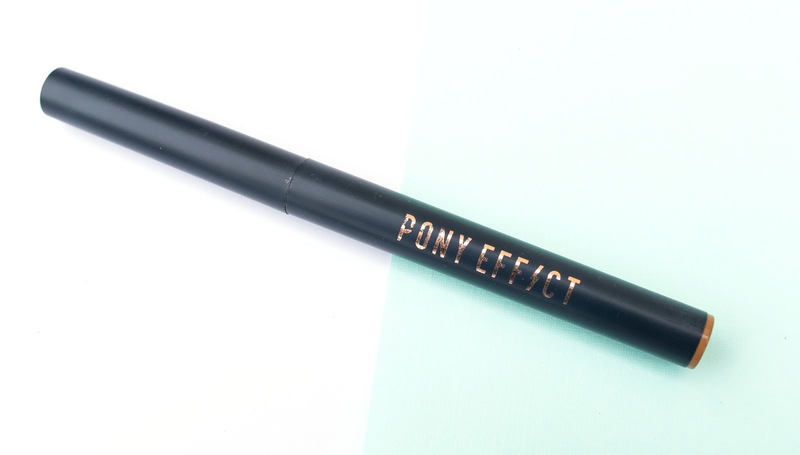 However if the one thing you disliked about other eyeshadow sticks is how thick they were, then these PONY Effect ones might be right up your alley! The product featured was sent to me for review purposes, however all thoughts and opinions expressed are mine and 100% honest. 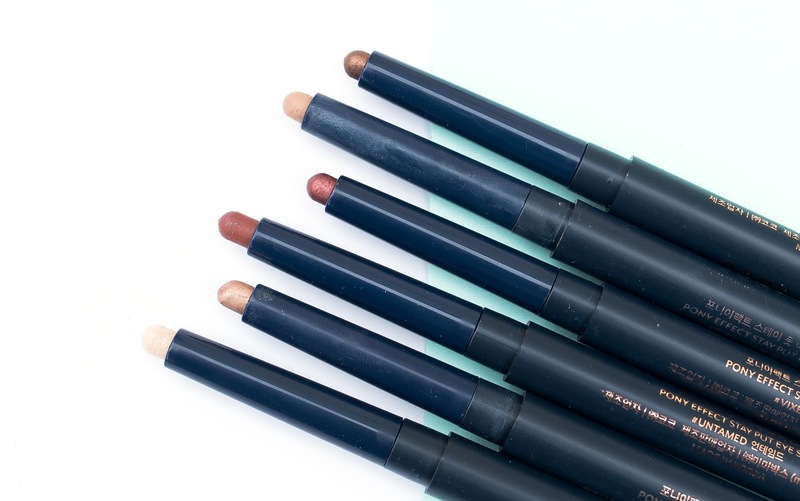 Have you guys ever tried eyeshadow sticks before? What are your thoughts on them? Thanks for reading, and I'll be back later this week with another review!